1. Preheat oven to 180ºC, gas mark 4. Brush the inside of 4 Waitrose Chef’s White Porcelain Coupe Rice Bowls (or 4 x 12cm diameter/4cm deep ramekins or tins) with the melted butter and dust with golden caster sugar. Set aside. 2. Remove the stones from the cherries, and scatter them over the base of the prepared bowls, tipping over any juice. 3. In a large mixing bowl, sift the flour and make a well in the middle. Add the eggs, caster sugar and vanilla extract, orange zest if using, milk and cream and whisk slowly, drawing in the flour until you have a thick, lump free batter. 4. Heat the butter in a small pan to a nutty brown colour and pour into the mixture, whisking continuously until the batter is smooth and glossy. 5. 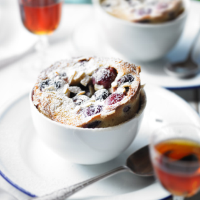 Pour the batter over the cherries, scatter over the flaked almonds and bake in the preheated oven for 35 minutes until the clafouti is golden and set. Dust with icing sugar and serve warm. This recipe was first published in Tue Aug 20 08:40:00 BST 2013.